We were in Dubrovnik in the early 2000s, as the departure point for a sailing trip through the Dalmatian islands near Dubrovnik. We spent a few days here, inside the walled city, before heading out to sea. 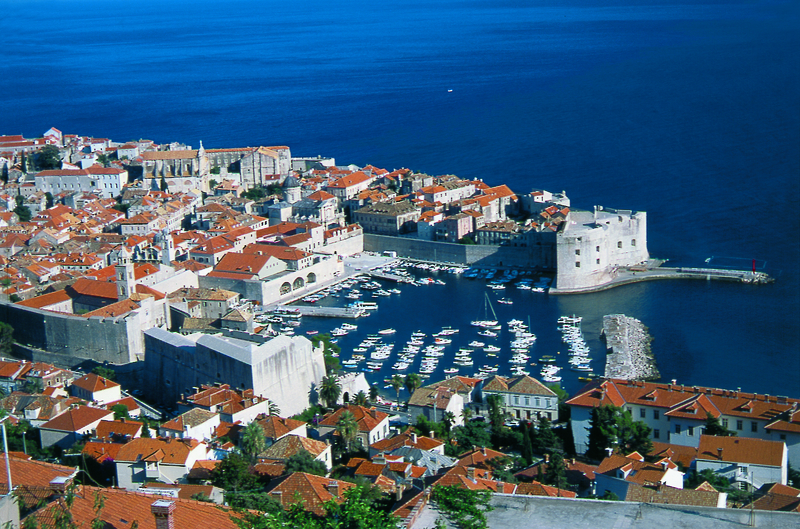 Dubrovnik is a coastal walled fortress/town, with the ramparts still in place and you can walk them and get great views of the town and surrounding sea. The main promenade/street is the Stradum, lined with shops and restaurants. Dubrovnik was seriously bombed during the Serbian/Bosnian war and it was just being restored when we were then. When you walked the Stradum, it all looked fine, but on the side streets you could look up and that a lot of work still had to be done and that the shelling had been heavy and serious. I understand that today nearly the whole town has now been restored.